SERAQUIN is a veterinary joint support product formulated as a tasty chewable tablet. Seraquin is a palatable, chewable tablet that contains ingredients specifically selected for joint protection and health. It is easy to give and can form part of your pet's diet for the rest of his/her life. 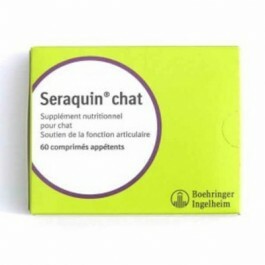 Seraquin can be given alongside any other prescription medications your vet has recommended. SERAQUIN is a joint supplement containing Glucosamine and Chondroitin. These ingredients occur naturally in the body, as part of the make-up of cartilage. What makes Seraquin special is the inclusion of curcuminoids, which are potent natural antioxidants. Curcuminoids may help to mop up free radicals in the joint which contribute to degeneration of the cartilage. Being so palatable, Seraquin is easy to give. 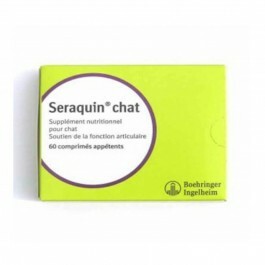 Most dogs and cats love Seraquin chewable tablets and will take the tablet willingly from the hand. You can give them as a treat or crush them onto their normal food. Seraquin can be given alongside any prescription medicines that your vet may recommend to help in the control of pain and inflammation. 60 chewable tablets in blister pack. 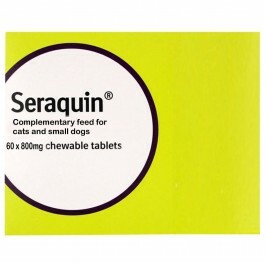 Seraquin tablets are very palatable and spontaneously accepted by most dogs and cats, however they may also be crushed and added to the food. Joint problems can occur over a period of time. Cats can be good at hiding problems, so they may only show subtle signs of discomfort and mobility problems. Change in grooming habits e.g. cat being unable to reach back due to decreased mobility so developing knots in the coat, or dogs licking joints more often. Change in temperament e.g. less tolerant with children and/or other pets, biting or scratching when certain areas are touched. If you have noticed any of these changes in your pet, it is worth consulting your veterinary surgeon for advice. Being overweight can put extra strain on your pet's joints so keeping his/her weight down is helpful. If your pet is overweight ask your vet for help in planning a weight reduction programme. Bear in mind that if your pet has poor joints you may not succeed in getting your dog to ‘walk off’ any excess food intake, or the cat to work it off by playing, so a reduction in food is usually necessary. Ensure your pet has a soft, warm bed to rest on. Use ramps instead of stairs where possible. Consider raised feeding bowls for dogs, for cats have food and water easily accessible. Cats may find low-sided litter trays easier to access. Cats may appreciate steps up to high sites such as a favourite chair. Thoroughly dry your dog after bathing or swimming. Gentle grooming and cleaning around the eyes and claws are important for cats that are too stiff to groom themselves. Regular, gentle exercise is a real help as it helps prevent the joints from stiffening up and maintains mobility so your dog can remain active. Cats may be encouraged to play. Dogs with poor joints should avoid very energetic exercise such as lots of stairs and excessive running. Your vet can help you work out the most suitable exercise schedule for your particular dog or cat. Hydrotherapy is becoming more common for exercising dogs with joint problems. This involves purpose built pools that allow safe, carefully controlled swimming. Swimming helps to build up muscle mass, which is useful for supporting joints. It is a low impact form of exercise so it won’t aggravate your dog’s joints. Your vet will know a centre where such a service is available. Ask your vet if they think acupuncture would help. The steps you can take to support your cat or dog’s joints will vary according to their age and health status. Your veterinary surgeon will be best placed to advise you on the options. Your vet may suggest you use a joint supplement such as Seraquin. For more information on Seraquin, please ask your vet.